In a two-part series, I covered the modern modular electric locomotives that emerged to cater to operators in our brave new liberalised railway world. Now I'll cover another market segment: the heavy diesels for open-access freight train operators. this train ran on rails of German Railways infrastructure branch DB Netz. Like in the two-parter on electric locos, there will be bits on industrial history and technology, European unification, company politics, and a review of current models according to producers – this time, in groups. To answer the section title: on one hand, there are diesel-only areas. On the other hand, before the appearance of the new multi-system electric locomotives, the alternative to speed up cross-border traffic were diesels. Indeed, the new open-access need for heavy diesels first emerged on a very specific sub-market: trains to and from the big ports of Antwerp and Rotterdam. 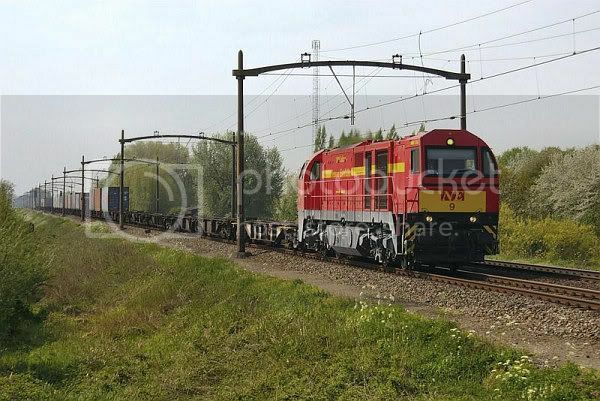 There were non-electrified tracks in the ports and in Belgium, and all four voltage systems on the rest of the connecting routes. 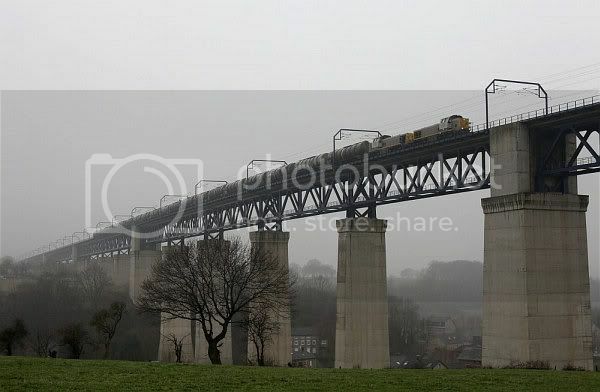 The use of heavy diesels quickly spread to other uses, including more long runs under overhead lines: for big industries that had access only to a branch-line, transport could be sped up by not changing locomotives. In part two on electrics, I indicated that the electric loco platform of all three giants of the rail industry (Bombardier, Siemens, Alstom) has recently been extended to include diesel-electrics. There have been single large orders (for Alstom/Siemens: 400 [Fret] SNCF class 75000, for Siemens: 100 ÖBB class 2016, which is passenger/freight). However, the private market for freight diesels is dominated by other players. The reasons: higher prices, lower power, problematic diesel engines, few references. But the makers want all of this to change. 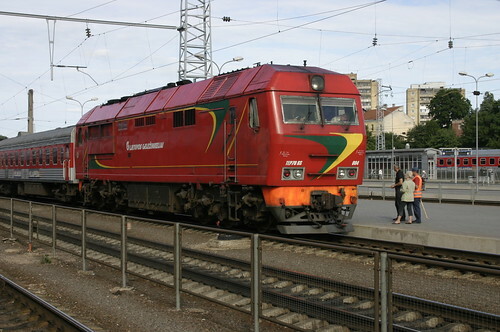 Lithuanian Railways LG ER20 is a six-axle, 2 MW, Russian broad-gauge version ("ER20 CF") of Siemens's EuroRunner. A new version with up to 3.5 MW is planned. For the new cross-border runs to the BeNeLux ports, operators first reached back to surplus existing stock. In particular, a family of 2.2 MW six-axle heavy diesels originally supplied from the Soviet Union to East Germany's DR, nickname "Ludmilla". 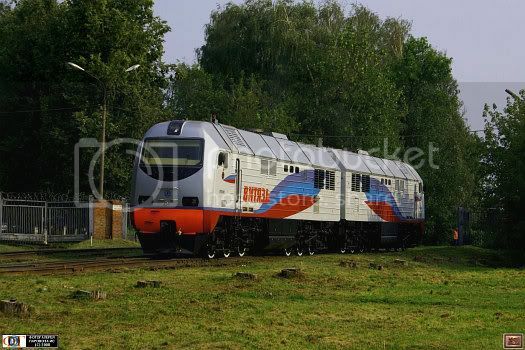 These robust machines were made by Voroshilovgrad Locomotive Factory (today Lugansk Locomotive Factory in Ukraine), with motors made by Kolomna Locomotive Factory (today a part of Russian Transmashholding). The DB class 241 are a couple of Ludmillas remotorised with a 2.94 MW engine specially for the port traffic. The broad-gauge (and larger cross-section) networks of Russia and Ukraine have plenty of diesel-only lines for the makers (the above mentioned two and Bryansk, also part of Transmashholding) to keep developing and building new types. What's more, Russia ditched a remotorisation programme using US-made diesel engines, pointing to the increased fuel efficiency and cleaner exhausts of new domestically produced ones. Bryansk's 2TE25A "Vityaz" double locomotive (2x2.5 MW, 2x6 axles) is the most modern freight diesel type in Russia: it made the switch to AC motors. However, while old and repowered Ludmillas are running across the EU, there are no new standard-gauge export versions from Russia or Ukraine. EMD (formerly a division of General Motors) and General Electric have been the top makers of diesel-electrics in the West for half a century, with exports all around the world. They are also state-of-the-art – for example, they made the switch from wound-field DC to asynchronous AC motors (which I described as crucial for electric locomotives) in the nineties. Above all, weight has to be reduced by a third for Europe's weaker rails. Height and width also has to be reduced for European clearances. In the US, locos usually run in multiple, on long runs. In Europe, they usually run alone, and not long enough to justify the hassle of turning them around before going back. Thus, big mainline locos here need to have drivers' cabins at both ends. From the eighties, EMD supplied railways in Britain (which has an even narrower cross section than the rest of Europe) with a loco 'slimmed-down' as above (Class 59), and from 1997, with an updated version (Class 66). EMD was quick to offer this to the operators of the emerging cross-border port services and other open-access traffic. Though the "Class 66" (the unofficial name 'inherited' from the first purchaser is much more used than the official "JT42CWR") has DC motors, the reliability and high traction effort ( = pulling force) lent by the six axles of the 2.46 MW type made it a hit with operators – less with drivers, who found it rather uncomfortable and noisy in the cab. Rival GE for its part teamed up with ADtranz (today Bombardier) for a whole new design: the "Blue Tiger". GE gave the diesel engines, electric motors and the electronics (based on their export version for Asia, hence the name). This machine has the same power but higher traction effort than the EMD rival, due to its modern AC traction motors. The wide cab and narrow body typical of American diesels look odd with a second cab added at the other end. At 23.41 m, the Blue Tiger is the longest single locomotive type on standard-gauge European rails. Diesel engines aren't all that great at starting from a standstill: they need to spin up to some speed to be efficient, to not cough. Thus, engineers looked for ways to transmit the torque from a motor axis spinning near its ideal speed to a wheel barely or not at all moving. One method is to use electricity. The diesel engine runs a generator, and the currents generated power electric motors: that's a diesel-electric. Another method for transmission is to use the viscosity of a fluid pressed between two rotating discs: that's the diesel-hydraulic. In the railway world, the diesel-electric became the preferred option, especially in heavy locomotives: diesel-hydraulic is more difficult to maintain, and lagged behind in maximum power. Yet, for some odd reason, hydraulic transmission was preferred in West Germany. One of the main makers in West Germany was Kiel-based MaK. In the nineties, its then owner Siemens did not see much future for diesel-hydraulic, while MaK's attempt to go diesel-electric (DE 1024 and its spin-off for Norway) was a failure – so Siemens sold it off to a minor rail supplier named Vossloh. Vossloh started a programme of modernisation and modularisation – and, with the help of the emerging open-access local freight operators, its sales exploded in a way they didn't expect in their wildest dreams. (You see one of their smaller products in a wind power plant's port in Jérôme's photo in the Tuesday OT.) Vossloh's rise can be epitomised by the fact that it was them who first broke the Franco-German rail technology firewall (SNCF class 61000II). 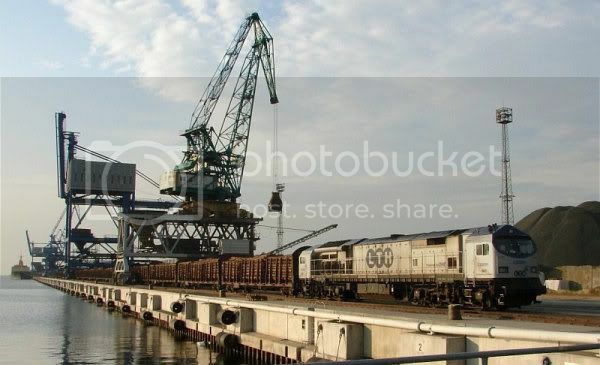 Vossloh also wanted its share of the heavy diesel market, and (over two decades after the last big diesel-hydraulic made in Kiel) created the G 2000BB. This loco is powerful (2.24, some 2.7 MW), but with only four axles, traction effort is limited compared to the previously shown rivals. The special asymetric look of the first twenty Vossloh G 2000BB was meant to enable both shunting from one end and line service from both ends (i.e. whichever end is in front). Later, they switched to full-width cabs (the Blue Tiger look). To eclipse the American six-axle rivals, Vossloh started new development into uncharted territory, in terms of hydraulic transmission maximum power. However, in the middle it, they made a total U-turn. Macosa was a company in Valencia/Spain making diesels under license from American EMD. When Alstom gained control of Macosa, it started developing a heavy diesel, incorporating some structural elements of its PRIMA electric locomotive platform, but diesel engine and electric motors were still from EMD (from the same line as those in the 'Class 66'). Vossloh bought this factory, and put its name on the finished Macosa-EMD-Alstom design: the 3.18 MW Euro 4000. Clean technology and... well, sort of. Also note the unmistakable Alstom front design. The immediate result was the Maxima 40CC, the most powerful diesel-hydraulic ever at 3.6 MW. The longer-term result was that Voith Turbo built its own factory in Kiel, and already won a big order for smaller locos (future DB class 260) – a footing to stand on while Maxima 40CC orders are in single digits (commercial deliveries started this year). 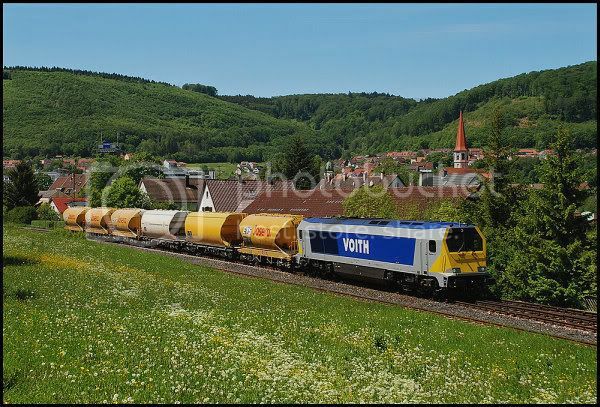 At 23.2 m, the Voith Maxima 40CC is another very long machine. And its style designer must hate curves. The makers also offer down-rated versions of the above two monsters (Vossloh Euro 3000, Voith Maxima 30CC and 20BB), but with barely a sale in freight version so far. In the last decade, the two American makers focused on improving fuel efficiency and decreasing harmful exhausts. Now they bring those technological improvements to Europe, too – while other diesel engine suppliers try to keep up. 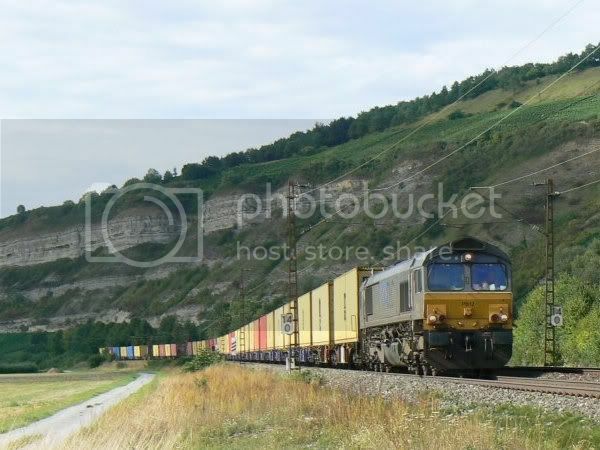 EMD updated the 'Class 66' (JT42CWRM) with a new diesel engine, also righting the cab problem (see changed side window; and also third sidewall door on the second photo). Meanwhile, GE saw Bombardier abandoning the Blue Tiger for its own design. As replacement, GE is bringing out a new European export version of its North American Evolution series: the 2.76 MW PowerHaul. For future orders, GE will partner with Tülomsaş for assembly in Turkey. However, one thing clouds the future for the makers: the big diesel market is set to shrink. The multi-voltage-system electric locomotives are now up and running: while two have to replace one six-axle diesel, the higher train speed is a plus. On the infrastructure front, the Netherlands opened the Betuweroute freight-only railway from Rotterdam to the German border in 2007, while Belgium finished the electrification of its Antwerp–Aachen line at the end of last year. Check the Train Blogging index page for a (hopefully) complete list of ET diaries and stories related to railways and trains. On a purely aesthetical note: for my taste, most of these new soot spewers look ugly, especially in contrast with older stylings like that of the Ludmillas. All power ratings I gave are for the diesel engines -- the power on the wheel is roughly 10% less, due to losses in the transmission (and the consumption of auxiliary systems). None of the EU-based makers build their own locomotive diesel engines. Beyond EMD/GM, GE and Kolomna, the main suppliers are: Caterpillar (based in Peoria, Illinois, USA), MTU Friedrichshafen (in Baden-Württenberg, Germany), Cummins (based in Columbus, Indiana, USA). Forgot another diesel engine maker: Ango Belgian Corporation (The 'Anglo' refers to the original investors a century ago; today it is owned by a Luxembourgian firm). But, of types presently in production only the Voith Maxima uses an ABC engine. 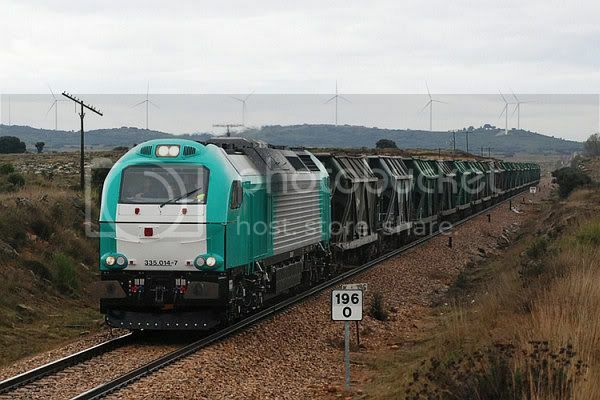 Alstom/Vossloh Euro ...: not only was the largest European delivery so far a passenger version to the Spanish national railways (28 Euro 3000 as RENFE class 334), but they could sell the largest batch back into the USA (NJ Transit's 33 3.13 MW PL42AC, see Wikipedia photo below), and hoped for more - but the new Buy American laws put a stop to that. Kolomna: the main product family, TEP70, is mostly 160 km/h, 2.92 MW express locomotives (below in the latest, TEP70BS version in Lithuanian colours from Flickr). Note that with TEP80, a 4.55 MW version not produced in series, Kolomna holds the world speed record for diesel locos since 1993: 271 km/h. 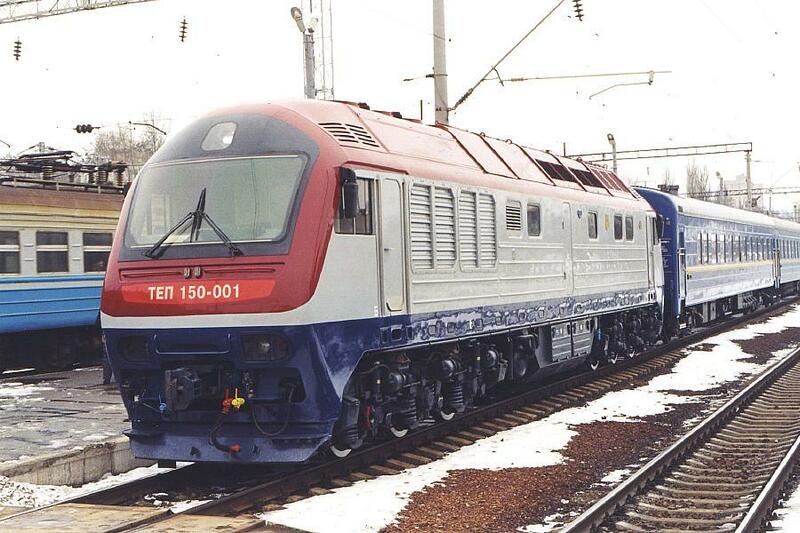 Lugansk: the Ukrainian company builds the 160 km/h, 3.1 MW TEP150 (below on photo from RailFan Europe.net). It got a modern front and a new engine, but the basic design is similar to the 'Ludmillas'. In Europe the engine builder certifies the locomotive meets the applicable emissions standards, in the US it is the locomotive builder, this along with a toughening of the crash standards convinced Alstom to not bid for anymore passenger locomotives, not any "Buy American" laws. MPI doesn't have any competition for passenger diesels in the US because EMD and GE can't figure out how to make any money with such a small market. When Amtrak is ready to replace their current GE's then you will see more bids. SUMMARY: The Massachusetts Bay Transportation Authority (MBTA) has asked the Federal Transit Administration (FTA) to waive its Buy America requirements on the basis of public interest to permit Vossloh Espa[ntilde]a S.A. (Vossloh) to manufacture and assemble two pilot locomotives in Spain. MotivePower, Inc., a domestic competitor to Vossloh has asked FTA to deny MBTA's request. I write in response to your letter dated September 3, 2008, in which you ask the Federal Transit Administration (FTA) to waive its Buy America requirements by authorizing the final assembly of two pilot locomotives in Spain. After careful consideration, FTA has decided to deny your request for the reasons outlined below. The decision to halt the order is tied closely to a contentious contract dispute between the two companies that bid on the project. Grabauskas said the T was likely to face a long and expensive legal battle regardless of which bidder it chose: Vossloh Espana S.A., a Spanish unit of a German company that was the low bidder but initially wanted to build two model locomotives outside of the United States, or MotivePower Inc. of Boise, Idaho, which was challenging Vossloh's bid because of the federal "Buy America" regulation. But the T's financial problems - "probably the worst financial condition that the T has been in in its history," according to Grabauskas - appear to have sealed the decision. Grabauskas said he is estimating a $140 million to $160 million deficit in the coming fiscal year. "Buy American" only kicks in if you use Federal money. Some of them might have that as an option ... while the Federal Matching Funds are often essential for the corridor ... track improvements or new track, signaling upgrades, grade separations, crossing work ... its a choice of the applicant project whether that includes rolling stock, especially since the infrastructure and the operator is not always in the same organizational structure. However, since rolling stock is eligible for federal matching funds, that seems more likely as a funding strategy for HSR (which, recall, can include 110mph diesel and 125mph electric services at the "Emerging" and "Regional" HSR tiers, in addition to the "Express" HSR which would be called HSR in Europe and Asia), which would be in a position to franchise the operations, with the franchisee providing the rolling stock, or else to fund the rolling stock with revenue bonding. I'm sure that the rules for the main Military Industrial Complex subsidy are different to the rules for funding of applications for federal matching funds for transport projects. In addition, I note that given that Vossloh España's products use EMD diesel engines, and given that the PL42AC does have permission to run in the USA, neither emissions requirements nor US crashworthiness standards can be a problem. There is much more to diesel engines meeting emissions standards that just the basic engine. The radiators and their cooling fans, the charge air intercoolers, etc. If you were to take a EMD SD70 locomotive which meets US EPA Tier 1 emissions standards, park it alongside a EMD SD70M-2 locomotive that meets US EPA Tier 2 emissions standards, then take the motor out of the SD70M-2 and install it in the SD70, you would have a SD70 that still would only meet Tier 1 standards. This is because the radiator is not a dual circuit system, and you do not have a large enough charge air cooling system. Re: the PL42C having permission to run in the US. It did at the time it was built however the standards were raised since then and it would no longer meet the new standards, hence no more can be sold here without reworking the design. It is a similar situation in Europe, Bombardier replaced the TRAXX 1 bodyshell with the TRAXX 2 bodyshell to meet the tougher collision standards relating to protection of the driver's cabin in a collision. So all the electrical components of the TRAXX 2 will fit inside the TRAXX 1 bodyshell, and the TRAXX 1 is certified to operate in 3 European countries, but no more can be built. The EMD 16-710 G3C-T2 engine is certainly EPA Tier 2, and it shouldn't be difficult to find fitting equipment to upgrade vs. the PL42AC even if the European ones would not be. At any rate, the locos Vossloh did offer to MBTA (and one other operator I can't find again) would have been under the new regulations. shown notice the large boxy structure ahead of the radiator, this is a air to air intercooler that cools the intake air after it leaves the turbocharger and before it enters the diesel engine. How tough can it be to meet the new emissions standards? Tough enough to convince Caterpillar to leave the market for building diesel engines for trucks. They couldn't build a diesel engine with acceptable reliability at a cost that was competitive. They had a significant chunk of the market. Tier 3 isn't going to be too bad, but Tier 4 is going to be real trouble. Thanks for the details and the great photo links. What I meant was that, would Vossloh be incapable to produce the proper extra equipment to fit on the EMD engine (new radiators, engine motor cooling, stricter temperature control, exhaust filters), it could go shopping for suppliers. However, let's at last have a look at European and US emissions standards in comparison. The Euro 4000 complies with EU Stage IIIA (2004/26/EC). For locomotive diesels above 2000kW, that standard is HC: 0.4 g/kWh, CO: 3.5 g/kWh, NOx: 7.4 g/kWh, PM: 0.2 g/kWh. Converted to the units of the US standard, that's HC: 0.3 g/bhp-hour, CO: 2.6 g/bhp-hour, NOx: 5.5 g/bhp-hour, PM: 0.15 g/bhp-hour. Regulatory authorities in the EU, USA, and Japan have been under pressure from engine and equipment manufacturers to harmonize worldwide emission standards, in order to streamline engine development and emission type approval/certification for different markets. Stage I/II limits were in part harmonized with US regulations. Stage III/IV limits are harmonized with the US Tier 3/4 standards. If my short read-up was correct, the primary emission effect of air intake temperature reduction/regulation is in NOx emissions, with the second effect being a general one in improved fuel efficiency. Can you tell me what part of the locomotive machinery impacts the one emission in which the US standard is (much) stronger, CO? Finally, I found this Vossloh presentation on development to meet new emissions standards (unfortunately a technologically shallow 'managerial' one), which confirms something I read earlier in a non-authoritative source: that the NJT PL42AC is homologated for EPA Tier 1, but designed for Tier 2 (p13). Sorry, service club meeting last night finished late. Re-thinking my position EMD would have to be involved with the Vossloh bid anyway. The big problem is everything keeps getting heavier, bigger radiators, more coolant, I shouldn't have said it wasn't possible. I wonder what would have happened if EMD lead the consortium in Name for the bid, even if Vossloh did most of the work? The MPI locomotives are roughly 136 tonnes on 4 axles. I wonder what would have happened if EMD lead the consortium in Name for the bid, even if Vossloh did most of the work? You mean, politically? In the decision, it seems the crucial problem was Vossloh's insistence to assemble the first two units in Valencia/Spain. 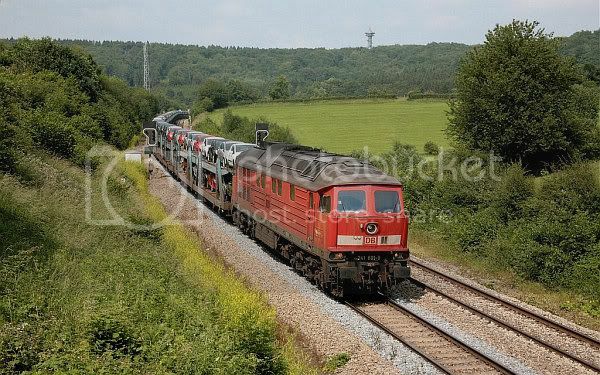 BTW, what engine would the MPI locomotives use? EMD, GE, or neither? The funny part is MPI offers two choices, either the 710G3C rated at 4000hp. from EMD or the EMD designed 3600hp 645F3B built by MPI using a crankcase assembly manufactured by GE. MPI and GE are the two largest suppliers of replacement parts (mainly remanufactured) for EMD 645E and F series engines. MPI is a subsidiary of WABTEC (formerly Westinghouse Air Brake Co.). Combustion chamber shaped to promote swirling of the gasses. Lean mixture (more air per unit of fuel). Catalytic converters to convert CO to CO2. I'm not sure that swirl techniques are practical on direct injection engines (including diesels), because the burning happens on the surfaces of the fuel droplets before they get a chance to evaporate. From that, I take, it is only influenced by the engine and the fuel? I'm at the limit of my knowledge on the subject, but for example, the engine temperature influences the combustion, so the cooling system indirectly affects the CO production. Here's an interesting article on the Honda Insight hybrid, where they went "all out" in trying to meet low emission and high economy targets. There are a LOT of tricks in use...not all applicable to railroad engines, obviously, but there is an interesting parallel between the two. 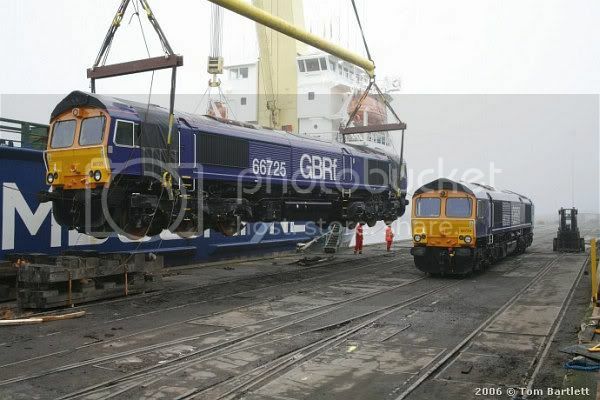 Could you tell me, for the same loco types as in the five linked pictures, roughly what distance they can go between refuelling? Is my impression right that on the US market, GE and EMD relate somewhat like Siemens and Bombardier here? (i.e. 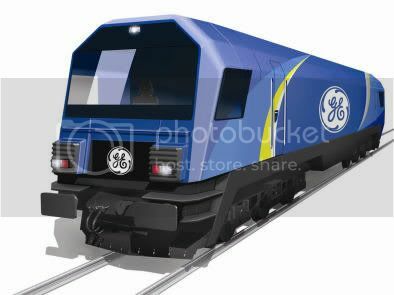 the GE diesels are overall better quality since the nineties, but EMD is good at sales)? 1. This is a tough question since there are so many variables. The EMD diesel will burn roughly 191.9 gallons per hour at full throttle. The GE Dash9-44CW will burn 210 gallons per hour at full throttle. Both locomotives offer a 5000 gallon fuel tank. 2. GE had been better at quality since about 1995 and had been steady building a lead on EMD. The debut of GE's GEVO series has put some tarnish on GE's reputation. EMD like the rest of GM had gotten arrogant, and poor at customer service. It took too long for GM to sell EMD and EMD's Engineering languished. EMD has been slowing gaining ground back, but the worry is how committed are EMD's new owners. Why don't the railroads just build the new tracks, tunnels, switchyards, and other infrastructure they need? America's major railroad companies are publicly traded companies answerable to often mindless, or predatory, financial Goliaths. They can also wipe out the stockholders if they go bankrupt, as many have. I wonder how that engine access door got crunched in on the GEVO??? Remarks: BNSF 3447, the Golden Globe switcher, shoves damaged ES44AC into the shop. A few new doors and railings are needed at least. The damage was caused by running through a trailer, see comment below. This was the lead unit on a coal train that plowed through an empty semi trailer in Perham, MN last week. Diesels replaced steamers as autonomous locomotives (which carry fuel and generate power on-board). But, for long, there was an engine type that was hoped to replace even diesel: the gas turbine, also known as jet engine. However, unlike that of an airplane, a locomotive's power use varies greatly in time -- and a gas turbine tends to waste fuel when idling. Add to that difficult maintenance, and you see why turbine locomotives were rarely successful, not to speak of being widespread. The state-developed GT1 has a monstrous power of 8.3 MW (in January, it pulled a 159-car, 15,000-ton test train). One half of the apparent twin locomotive houses the turbine and generator, the other the fuel tank, but all wheelsets (2x6) are driven by electric motors. Wärtsilä reciprocating engines used in static trigeneration (power, heat, cold) achieve a remarkable 90%+ efficiency in extracting the energy out of fuel (oil, biofuel, gas etc). Is there any company using trigeneration for rail? (I'm thinking of refrigerated cars here). Well, they have it easy: they don't have to change power output much and fast. That is true - it takes 10 minutes for the power generating plants to get up to speed. But in load balancing on power networks that is sufficient. but I just love these diaries. I wish my father was alive to read them...he was a big railway fan, built models and such. One of the few times I ever saw him get excited about anything was when we saw a "rolling drop." ET's advantage (imo) is the wide range of detailed knowledge from different disciplines, coupled with a readiness to share in a less than nerdy manner ;-) This is like Operational Research in it's purer form. I think we could do it better, but it is pretty amazing if you think about it, and compare with other sites. My favorite of all time for aesthetics is the GG1 used by the Pennsylvania Railroad. I got my Lionel electric trains when I was a kid in the 1940's and still have them. However I've never been willing to spend the money for their version, which keeps going up in price as the years go on. It is after all a toy train system, not a model train offering as the serious fans engage in. One more note if you want to catch a Ludmila in Western Europe, hurry. With the severe recession, DB is disposing of theirs quickly. 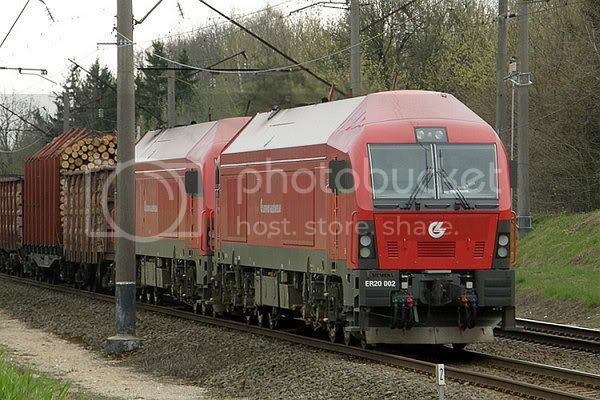 The DB-owned freight Ludmillas have been largely withdrawn from cross-border services after the electrification of the Montzen route, however, they continue on domestic runs. DB only disposes of those locos that are due for general inspections (since spring this year) -- then again, I believe their number now fell under 100. (Of course, the above only applies to the freight version, the class 234 passenger Ludmillas aren't affected by the recession.) There are some private operators with Ludmillas, I don't know what their plans are. You know Sven, in german exact is genau. In most languages, exact is pretty, well, exact. Hard to get better. But in german there's a standard phrase, ganz genau, which might translate to completely exact, for those for whom exact isn't exact enough. Notice the temporary wooden railings.